Shredding with the ancient Gods: That’s freeriding in Greece. Janne Koivistoinen painting the landscape of Kalavryta backcountry. Zeus and his buddies already knew: you can score blower powder on Greek mountains and that’s why the choose to live on top of them. With the Greek segment of Warren Miller’s “No turning back” freeriding in Greece slowly started to earn the reputation it deserves as a freeriding destination. “Frozen Ambrosia” is another nice flick by Greek filmmaker Constantine Papanicolaou. “The Thing About Greece” is another way to get an overview what’s going on in the Greek mountains. Greece is a very mountainous country, in fact the third most mountainous in Europe after Norway and Albania. Almost 80% of the it’s landmass is covered with mountains, so you will hardly find a spot with none in sight. The impressive Mt. 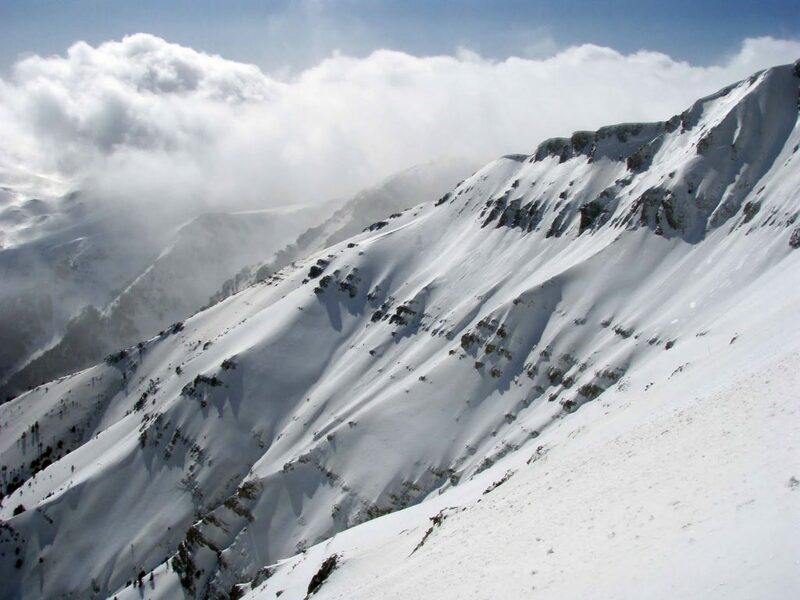 Olympus range in the northeast is the highest with Mytikas, its highest peak on 2’917m. No wonder the ancient Greeks considered it as the home of the gods. You might be surprised, but despite being world-famous for its sunny beaches, Greece sports around 20 ski resorts with elevations up to 2’480m. Some only operating one lift, others like Parnassos are fairly big and modern and thus allow for some serious choice. 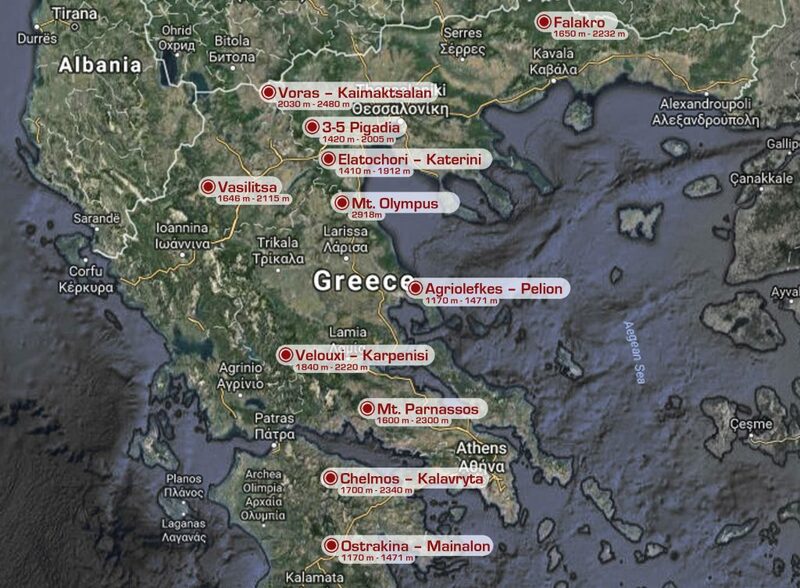 All the Greek ski stations you need and Mt. Olympus. You will find nice crowds on the mountains. Greece was a throwback in time somehow. I felt like back in the 90ies when snowboarding took off in the Switzerland. You can feel this spirit of optimism everywhere and, as it is a small scene, everyone knows each other. Hence, the snowboarder/skier-ratio is even higher than during the peak of snowboarding in the Alps and you can still find lots of the oldschool stances. But still, it’s unlike Switzerland, where almost every child used to learn skiing or snowboarding back in the days. Compared to the whole population of Greece, the wintersports enthusiasts are beneath notice. It felt like skiing and snowboarding is just starting and therefore you will see lots of first-timers in the resorts. A pretty funny thing to watch while on the chair. You will find everything from mellow tree runs overlooked by completely snow covered “ghosts” to very technical terrain and bottomless steeps. In fact, that is what we were searching for. The lack of snow on the lower slopes somehow spoiled the fun but we still found nice features to play with. As the climate is very moist compared to central Europe, the snow in Greece is slightly different. More moisture means the snow sticks to everything, especially trees, rocks and campervans. It also means more weight, which makes the snow settle faster and build a slightly more compact snowpack. With all it’s pro’s and con’s regarding fun turns and avalanche danger. While in the big resorts of the Alps an open piste means a safe piste in terms of avalanches, don’t expect this to be the same in Greece. Even though the resorts do some avalanche monitoring and safety, they are not on the same level of the game. So if a piste is open it doesn’t mean much more than it is open. There is no such thing as an avalanche information service so make sure you have the knowledge to decide for yourself whether a slope is safe or not. To sum it up in one sentence: if you go freeriding in Greece, you are pretty much on your own. The terrain – compared to the Alps – is very remote so dropping down the backside of a mountain is a bad idea unless you have your plan how to get back to civilization. You can easily end up in a valley that has no roads whatsoever. Finding a way back is not always easy. Keep that in mind, getting get stuck in a deserted valley is life threatening: no mobile coverage equals no rescue. To sum it up in one sentence: if you go freeriding in Greece, you are pretty much on your own. It’s not only nice to connect to the locals, it will as well help you score the best conditions. Your best bet is snowreport.gr and their Facebook channel. The page snowclub.gr the Goodtimes Mag and snowboard.gr and their Facebook are good resources of local know how as well.